When users install ad filters out of a desire to avoid unpleasant ads, they usually end up blocking all ads. This does little to incentivize individual sites to clean up their ads, because from the perspective of any web site owner, users decide whether to block ads mostly based on their experiences on other sites. As more users turn to ad filters, debates about ad filtering are becoming increasingly polarized. A pro-ad faction screams “blocking ads is like stealing from web sites”. An anti-ad faction screams “showing me ads is like kicking me in the groin in the hope that a penny will fly out of my pocket”. What if a future version of Adblock Plus only tried to block bad ads by default? The immediate result would be negligible, because most ad networks today are somewhere between bad and terrible. But some users would feel more comfortable enabling the blocks, and web site owners would have a harder time blaming visitors for missed revenue. “Block distracting ads” would block ads that animate, ads with bright pink, gigantic ads, <audio> ads, ads that use absolute positioning to cover other content, and plugins. “Block slow ads” would block ad scripts that do not use async or defer, any ad that uses more than 5 sequential or 10 total requests, any ad content that hasn't finished loading after 500ms, and plugins. Note that these are all things that can be detected by the client, which already has a filter set that distinguishes ads from non-ads. Upon blocking an ad through one of these heuristics, the entire ad network should be blocked for a period of time, so that Firefox does not waste time downloading things it will not display. The filter set could also specify ad networks known to specialize in distracting ads, or ad networks that are slow in ways the heuristics miss. These would block almost every ad network today, assuming the curators err on the side of over-blocking when a network carries multiple types of ads. I can only name one ad network that demonstrates the slightest bit of competence at keeping out scams and one ad network that actively gathers feedback from viewers about individual ads. With improved incentives, more ad networks would try to do the right thing. I look forward to a future where advertising is a truly low-transaction-cost way to compensate free content providers. I look forward to innovators and creators once again having a way to connect with people who might genuinely stand to benefit from their work, without having their voices drowned out by screaming scammers. Once bug X is fixed, tweet joyfully. Once bug X is fixed, update some documentation. Once bug X is fixed, add a feature to a fuzzer. Once bug X is fixed, retest a fuzz testcase that I assumed triggered bug X but might in fact trigger a different bug. Once bug X is fixed, add a regression test for bug W.
Once bug X is fixed, see if it also fixed bug Y.
I could CC myself to the bug, but then I'll get lots of email and might forget my reason for being CCed. I could create a dependency, but that sends everyone else confusing bugspam and gives me notifications that are easy to miss. I'll see my note the next time I run after-fix after bug 661469 is fixed. Prune fuzz ignore lists as the relevant bugs are fixed. 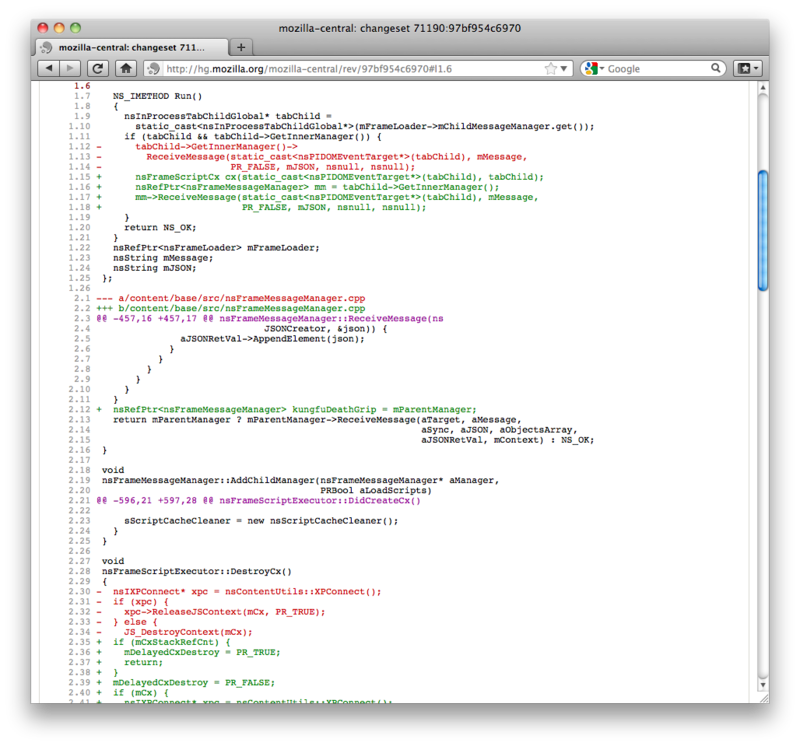 Find obsolete skips and fails in Firefox's regression-test manifests. When a new crash appears, we often want to know whether any code on the stack changed recently. Historically, this has required opening each source link in a new tab and waiting for hgweb to generate megabytes of HTML. Even if you only look at the top 10 frames of each stack, this gets boring quickly. I created stack-blame to make this easier. 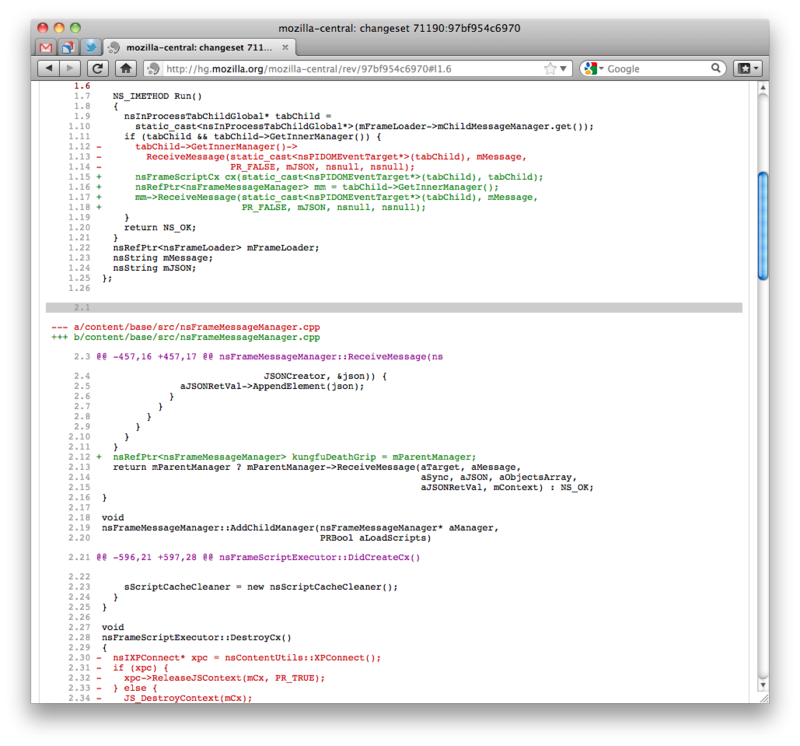 It shows 5 lines of context around each line of the stack trace, and highlights fresh lines in green. In the stack-blame output for this crash report, it's easy to see that of the cairo functions on the stack, only _cairo_quartz_surface_finish was touched recently. Submitted to the US Department of Commerce in response to their call for comments on Copyright Policy, Creativity, and Innovation in the Information Economy. Let's allow musicians to choose to give up their monopoly on distribution rights. In return, let's give them money in proportion to the popularity of their works, starting with money the government and ISPs would have spent on copyright enforcement. The premise of copyright is that the monopoly rent of a work is a good proxy for the benefit to society of the work's existence. This is no longer the case, at least for recorded music. People who can't afford recorded music don't get to enjoy it. People often can't listen to songs before purchasing them, so they purchase too few songs or the wrong songs. People are denied the joy of sharing music with their friends. Transaction costs form a large portion of the purchase price. Promotion costs are high in order to overcome consumer reluctance to spend money on an unknown. Because of copyright, most of the potential societal benefit of a new song goes to deadweight loss and transaction costs. Only a tiny portion makes it to the musician. Government resources are spent on copyright enforcement. A hidden tax is levied on internet connections as ISPs are forced to filter, forward notices of infringement, and respond to subpoenas. User-generated content is at risk from fraudulent takedown notices. Popular infringement, combined with sporadic-but-harsh enforcement of copyright laws, diminishes respect for all laws. DRM conflicts with fair use. DRM anti-circumvention laws conflict with free speech among software developers. DRM legitimizes infringement in the minds of users who find they cannot listen to purchased music on a new device. Copyright is becoming increasingly inefficient and harmful. Let's try an alternative, and let musicians experiment with a wider range of promotion models.